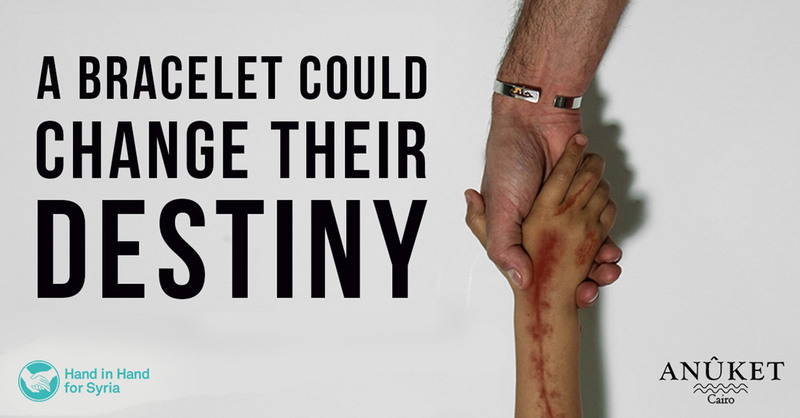 We are excited to be working in partnership with Anuket, a contemporary Egyptian jewelry brand to launch their latest piece - a bracelet, inspired by Hand in Hand for Syria. The back of the cuff says ; which is Aleppo in Arabic, the front of the bracelet is a symbol of a hand, in hand. Anuket has a proud trademark or regularly contributing a percentage of their sales to charitable organisations - the full proceeds from for the sale of the exclusive 'Aleppo' bracelet will be going directly towards supporting our humanitarian work on the ground in Syria.